These step-by-step instructions will tell you how to eliminate or reduce allergy causing house dust mites (HDM) from a bed. Read carefully because beds are a favourite hiding place for mites. All doctors agree that the first step in managing allergy symptoms is the avoidance of triggers where possible. It is possible, and easy to keep mites from establishing a colony in a bed. 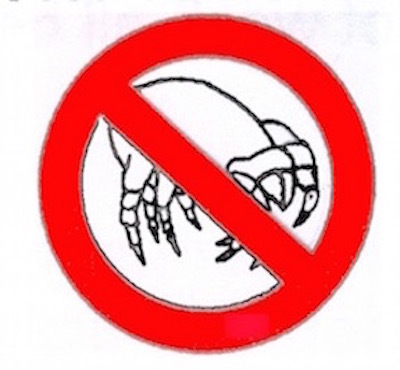 Follow these simple instructions to protect the vulnerable from mite exposure. The most vulnerable are developing children who may think it's normal to always sneeze, wheeze or itch. Put a micro-porous cover on the mattress to seal mites in and stop new ones from finding a home. Place a heavy cotton quilted cover over the mattress to absorb perspiration and collect discarded skin scales and dust. Hot wash all bed linen weekly. The quilted cover only needs to be hot washed every two weeks but it must be completely dried before being put back on the bed. Micro-porous covers should be damp wiped while the bed linen is off to get rid of any dust build up. Notations: Nightwear should be made of cotton to help absorb perspiration and must be kept for bedroom use only to prevent a transfer of common household allergens, such as from cats, into the bed. Soft toys that are taken into beds also need to be hot washed weekly. Or if suitable, placed in a good quality microwave oven, on high for 5 minutes, then cold washed after to remove 'dust'. Please remember - mites are up to 75% water, they are like a tiny water balloon - ten minutes in a hot drier will kill them dead. Don't forget to hot wash the blankets in a pet's basket. Dogs can suffer from mite allergy as well! *Children with eczema may need special care as the micro porous covers on duvets and pillows can be 'hot'. Alternative methods may be needed such as using high quality Egyptian cotton covers on duvets and pillows and hot wash these weekly. The weave on this fabric should have a pore size less than 10 microns to prevent adult mites from passing through. 'Removing dust mites to reduce allergic response in sensitive children may enhance their personal development and improve learning, memory, attendance, concentration and academic performance. Learning, School Performance, and Children with Asthma: How Much at Risk? 'Journal of Learning Disabilities', Vol 26. No. 1, Jan. 1993.p 23-32, Celano M.P, Geller R.J.